I don’t know about you but I find it challenging to live fully and freely in relationships with others while simultaneously remaining in communion with God. 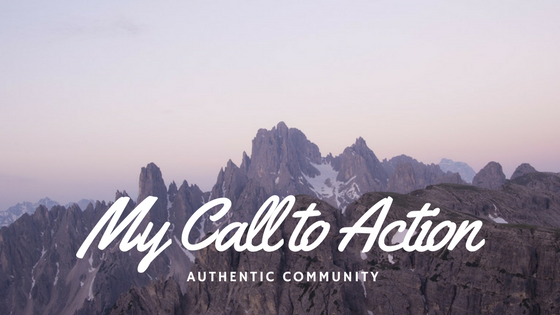 My call to action is living and communing authentically! The other night, I had a vivid dream about several mountain ranges filled with high peeks. An outdoor deck nestled at the base of each mountain while a house perched solidly on the highest point. Halfway up the mountain was a “docking point” – a small out-shoot of metal. As I viewed the sheer mountain face, I questioned how one would get from the deck to the house. Instantly, I whizzed above even the highest apex. Each mountain was a solid rock with unique and beautifully intricate marble-like veining. The second was at the top where a different kind of “dwelling” occurs! It is where I get to know God in reading the Bible, prayer, solitude, and lingering in His Presence. But there is a third choice – neither up nor down! The place of “self” – disconnected from both God and others. This is the most precarious spot. The longer I meditate on the dream the more truth it reveals of the life choices I have made and am making in relationships. Regrets, like heavy dew, settle on me as I think of how often I choose to sit in the “docking-point” – disconnected from others and trusting in the frailty of myself. I feel God’s invitation to enter more transparently into the lives of all those around me while at the same time allowing Him the reins to draw me closer with Him. I can do neither in my strength or power. To fully share life together has a spiritual dimension – not just in our relationship with God and but also with others. I greatly enjoy “deck” times! Hanging out… relaxing... getting to know others… often laughing… sometimes crying… reminiscing…sipping lemonade on a hot day or hot chocolate on a cold one. Relationships with family and friends fill life with a rich hue of appreciation and growing respect. My ever-expanding circle of friendships are woven intricately with threads of Jesus Christ and the fullness He brings. The deck is where I introduce Christ to people! The first “know” in this verse means a growing kind of knowledge, to come to know and to know personally. The second “know” is a different word meaning to perceive, to know absolutely, to have complete knowledge of. The mountain is where I come to know the Triune God more fully and personally and where I pray for people! In the middle is a desolate place! It is the place of neither hot nor cold. (Revelation 3:16) The place of disconnect with God or others! I have the option to go, stop or even stay here. It is the forty years in the desert place. The place where no one really wants to stop, yet where all will at some point. Every moment is a choice – a choice about where I will live and commune. Will it be the deck, the mountain, or the dock? True authentic living always breathes life of God into people. Always! fellowship with those around me. share how much You mean to me. and be fully known and loved. I try to avoid, but must maintain. Want to check out other blogs about living in healthy relationships? ← “The Tomb is the Womb of the Resurrection!” Jesus is Alive!